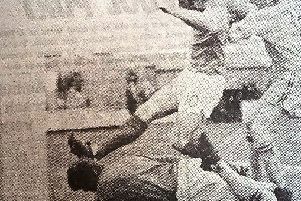 Scoring memories with vintage Hartlepool football photos - are you in the shots? Cotsford Junior School football team with their trophies and sponsor Ken Hall of Biceps Gym, front from left: Darren Atkinson, Colin Bell, Davie Rowe, James Huntley, Carl Chisholm; back row: Owen Penfold, Michael Kirby, John Stobbs, Stephen Temple, Wesley Hepburn, Andrew McIntosh. Date unknown. Today we take to the pitch with a new Memory Lane series - featuring local football teams. Two school teams and two mystery sports photos are the focus of our page - but your team could be the star next week. A prize-winning mystery football team - can you help solve the puzzle? “Generations of Hartlepudlians have been involved in community football over the decades,” said Mail archivist Susan Swinney. Prize-winning teams from West Hartlepool Secondary Technical School and Cotsford Junior School are featured here. “But we’ve also unearthed two mystery sports photos from our archives. Any information would be welcome,” said Susan. West Hartlepool Secondary Technical School football team in 1950. Winners of the Schools Senior League Shield and Cup 1948-49. 'Shown back row (left to right) Mr J S Howard (Headmaster), R H Winspear, T S Wilkinson, D Scott, C W Pitt, B Bell, G Newton, B R G Houseman and Mr G W Churchward (coach). 'front row M K Stokes, J Rayment, B W Fagan, L Carroll, T G Foster, D S White, F Ryder, W Young and A Wiliamson. A football skills session at a mystery Hartlepool school in the 1950s.